Bradford pools, just like our spas, are on the cutting edge of extremely refined, light weight, high strength custom vessels. 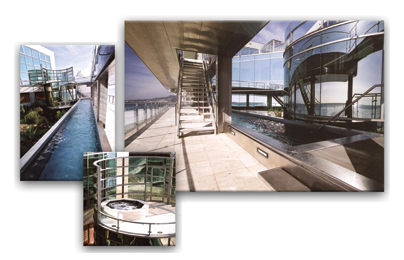 Made from only the finest 304L and 316L stainless steel, our pools will last a lifetime with less care and maintenance than any other competitive construction material. 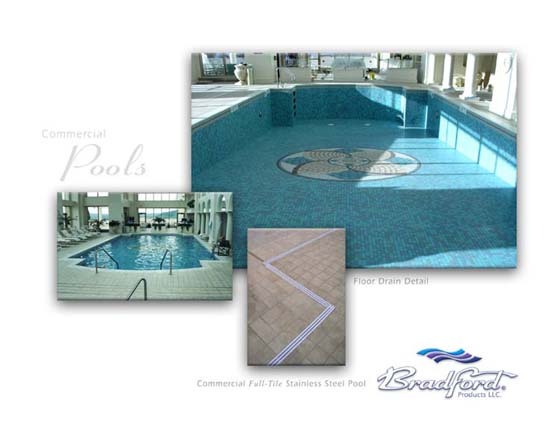 The Bradford micro-swirl finish may cover the whole pool, be showcased with tile, or completely tiled. The strength to weight and full load to weight ratios are so good that the pools are superb vessels for retrofitting on ground or above ground floors or lightening a new build floor system, when compared to concrete or gunite. Assembly can be in one piece through a roof or an on-site build, delivered through a doorway. No modern material is as cost justifiable for maintenance, longevity, corrosion resistance and long term structural rigidity as stainless steel. The material will not de-laminate, crack, peel, corrode, discolour, leak or require renewing finishes over its life. Stainless steel is a high quality recyclable material, inert, able to be sterilised and of great aesthetic value. 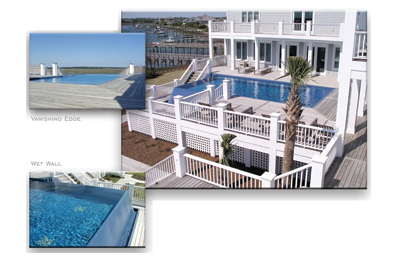 Combinations of pools and spas, shapes and sizes are endless. Add to this variability a wide range of custom falls and water features from Bradford’s custom shop and your imagination is without limit. Although Bradford does not apply for health code approvals or building permits, each pool design can be accompanied by a set of "D" size drawings and details to assist the architect and/or contractor in filing for their permits. 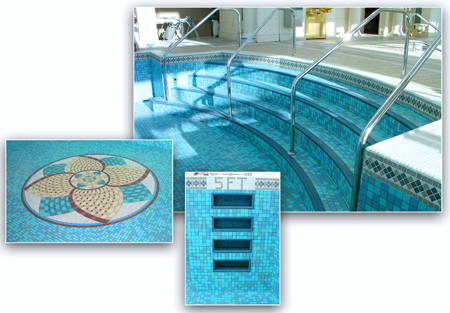 Bradford uses the latest state of the art computer aided design (CAD) ‘solids modelling’ to produce colour-shaded renderings of a pool design. Other optional capabilities are the transfer of lines (.dwg, .dxf, .sat, IGES and others), conversion or creation finite element modelling and finite element analysis of a pool project. Through e-mail, Bradford Products can also assimilate any electronic drawings the architect of contractor may have, using such data to build upon for a new pool or spa. With our new parametric CAD program we should be able to create variable sized families of pools for franchised hotel, health club and business groups. This will help shorten design cycles and enhance specific motifs which designers may wish to replicate at each site. Architects, engineers, and designers have long been advocates of Stainless Steel because of its appearance, strength and high corrosion resistance. It is one of the most durable materials used in architecture and construction today and is 100% recyclable. Made of low carbon steel, which contains chromium at 10% or more by weight, Stainless steel does not deteriorate and actually has a "self-healing" corrosion resistant film on the surface of the material. This film forms spontaneously when the chromium in the steel reacts with oxygen in the air.